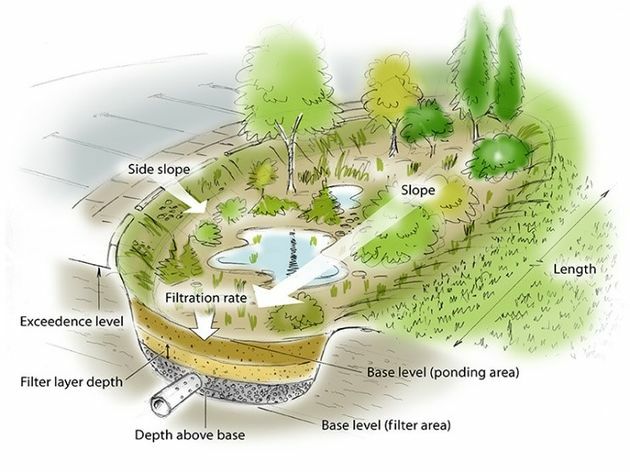 Green infrastructure is constructed environments that manage surface water runoff. This is a city's method for "going green." The aim is to treat the water and retain it at the source (where rain falls), instead of routing excessive amounts of contaminated, untreated runoff water through stormwater systems and out to rivers. Not only is green infrastructure an effective means to clean and reduce surface runoff, it is aesthetically pleasant for communities. Green infrastructure can be incorporated into any urban area. This can apply to new development, redevelopment, or retrofit existing infrastructure. Types of green infrastructure include urban agriculture and community gardens, rain gardens and window planters, rain barrels, vegetated roofs, and permeable pavers. Reduces the amount of surface runoff entering waterways. Removes sediment-bound contaminants from runoff. Reduces flashiness (extreme high and low flow levels) of receiving waters. Provides an environment conducive to contaminant degradation. Increases water infiltration to recharge groundwater. Slows the flow of surface runoff to prevent erosion. Reduces the "heat island" effect in urban areas. Reduces water temperature before entering receiving waters. Provides aesthetically pleasing environments for society. Urban agriculture includes animal production or plant cultivation in urban areas for growth and distribution. 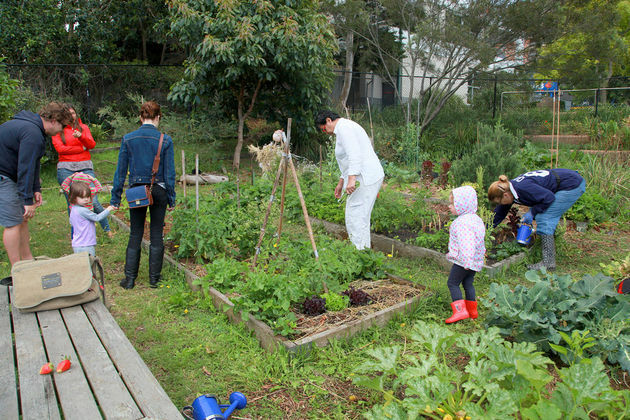 Increased property values, infiltration, contaminant removal, and physical activity and education for the local population constitute main benefits of urban agriculture. As urban areas face increasing runoff, developing agriculture greatly reduces the runoff volume. Existing stormwater infrastructure is increasingly becoming limited as it ages, begging the need for more cost-effective solutions, such as agricultural production. Compared to construction areas and normal agricultural production, erosion is minimal in urban agriculture. Gardens that use shredded wood mulch instead of wood chips reduce sediment and mulch loss over areas such as sidewalks. Conservation tillage is one of the main methods used to reduce erosion. Tillage can improve the water retention capabilities of soils. Combining tillage and composting was found to reduce total-P by 70%, reactive-P by 58%, and N by 7%, compared to unmanipulated soil. When 1" of rain falls in an area, roughly 800 gallons of water washes from roofs (average roof size of 1,300 ft2) quickly flooding the receiving catchment. 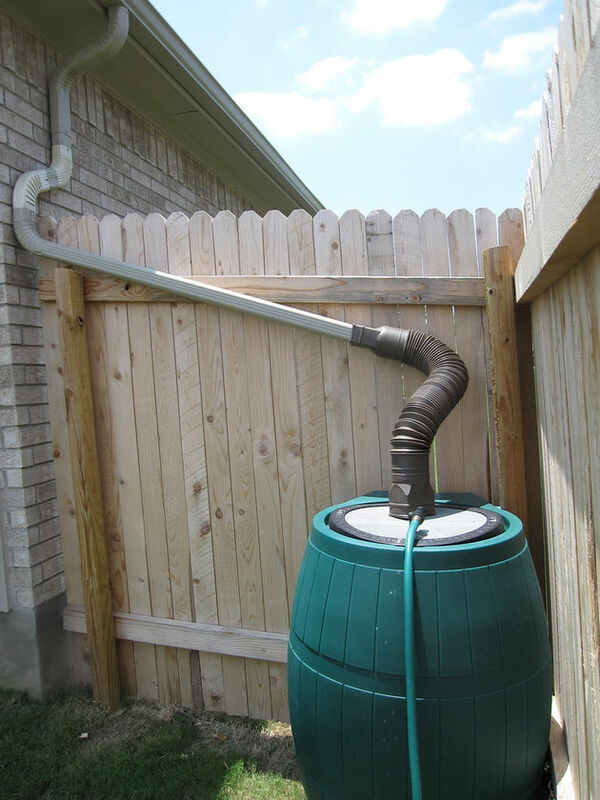 Place a rain barrel, which is a large 30-50-gallon container, to act as a holding tank under a special spout. This reduces the amount of roof runoff entering storm sewers. The rain barrel can be used to water a rain garden in times of less precipitation. Rain gardens are gardens placed in areas that normally pond, and near storm drains. Rain gardens and rain barrels are good practices for reducing the amount of contaminated water from roofs, decreasing pulses to storm drain receiving waters, and increasing infiltration to recharge groundwater. Place window planters to catch precipitation before it hits the ground. A window planter is a box with plants, either outside the window or on exterior decks and railings. Incorporating rain gardens and window planters to receive rainfall reduces home water use and helps to create a beautiful landscape. During the initial stage of a rainstorm, more contaminants are flushed compared to the remainder of the rainstorm. This effect has been termed the "first flush effect." The initial rainfall picks up dust sediments settled from the air, dry deposition from the transportation or factory industries, and aged materials composing roofs, gutters, and spouts. The main contaminants found in the research of roof runoff are heavy metals, such as cadmium, zinc, and lead, and low levels of microbial pathogens like Aeromonas, Salmonella, and Cryptosporidium. In some cases, interaction with wildlife or deposition of airborne sediments can make green roofs a source of some pathogens. Depths displayed in a cross section of green roof (left), and bare roof (right) (Speak, 2013). 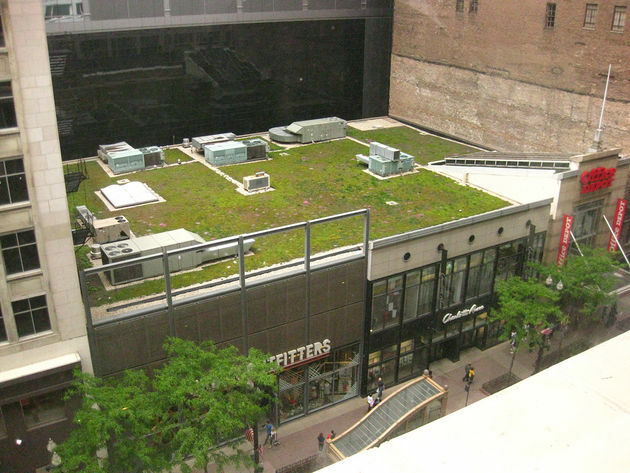 Installation of vegetative rooftops, otherwise known as green roofs, can reduce instances of chemical and microbial contamination in the runoff to storm drains. Studies indicate that water retention of green roofs can be between 45% and 90% for small storms, and 50% to 60% for larger storms. This is highly dependent on the substrate depth, soil type, amount of organic matter, and plant type. Several advantages of using vegetative roofs include reduced water ponding and flooding, improved water quality compared to roof catchment areas, and pleasant views of wildlife habitats. An example of the design for a vegetative roof is shown. Design for a bioretention system. Bioretention basins are vegetated basins that collect water and promote infiltration before entering storm sewers. Essentially, they are large rain gardens. Bioretention systems are effective at reducing water temperature before draining into greywater infrastructure. Shallower depths for these basins prevents extended standing water time, which in turn reduces the possibility of increased insect populations like mosquitoes. In a study performed by McIntyre et al. in 2014, filtration through a controlled biofilter mimicking Bioretention basins reduced all heavy metals tested, ranging from a 91% to 99% reduction. Additionally, polycyclic aromatic hydrocarbons (PAHs) were reduced by 95%. Vegetative strips are exactly what they sound like, strips of vegetation integrated into the landscape within impermeable surfaces. For example, these strips can be between parking lots or lanes on a divided highway. Sometimes, these strips are termed swales; the names can be used interchangeably. Larger particulates over 125 µm washed from roadways, for example, are easily retained within grassy swales. Smaller particulates are not as easily retained. The problem with this is the smaller particulates are better at sequestering metals like Cu, Pb, and Zn. Loss of the small sediments in surface runoff allows metal contaminants to mobilize. 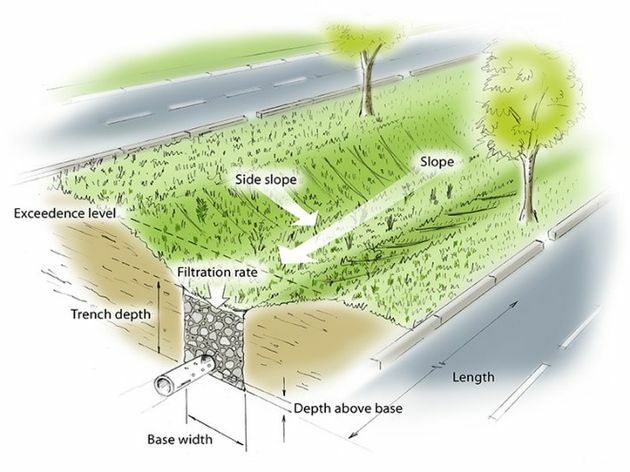 Vegetated strips and swales can mitigate PAH contamination from vehicle traffic. Establishment of riparian buffers (Mattas-Curry, 2012). Riparian buffers are highly vegetated areas adjacent to waterways, streams, rivers, or open channel infrastructure. The combination of grasses and woody vegetation improves efficiencies of these buffers. In 2003, Lee et al. determined that riparian buffers can reduce total suspended solids (TSS) by 97%, N by 94%, and P by 91%. However, increased rainfall events lessened the riparian buffer efficiency. PAHs and heavy metals bound to larger sediments can be trapped in the buffers before runoff enters the waterway. Permeable pavements, or porous pavements, permit infiltration because they are porous. Gravel and rocks can be used for this purpose. Porous pavers are constructed with large pores in which vegetation can grow, allowing water to easily seep through and into the ground. Permeable pavement is slightly porous with a deeper, more porous layer consisting of aggregates combined with soils. Instead of an impervious surface which creates flooding (i.e. 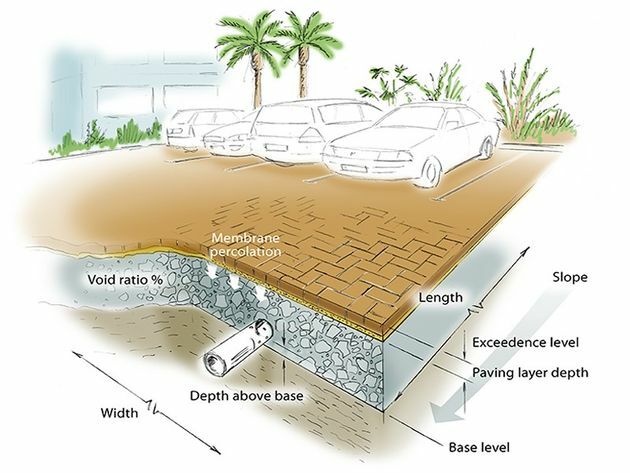 in parking lots), permeable pavements are an alternative that reduces runoff and flow to drainage areas. At the same time, pollutants can be removed through infiltration. 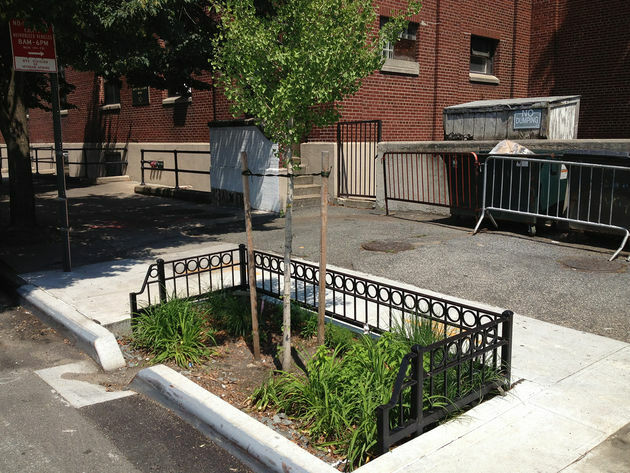 Audubon, M. Going green with stormwater: Rain gardens. In M. Audubon (Ed. ), Broad Meadow Brook Conservation Center and Wildlife Sanctuary. and Low Impact Development (LID) Designs Within the City of Trinidad. Charlesworth, S. M., Nnadi, E., Oyelola, O., Bennett, J., Warwick, F., Jackson, R., et al. (2012). Laboratory based experiments to assess the use of green and food based compost to improve water quality in a Sustainable Drainage (SUDS) device such as a swale. Science of the Total Environment, 424, 337-343. Charters, F. J., Cochrane, T. A., & O'Sullivan, A. D. (2016). Untreated runoff quality from roof and road surfaces in a low intensity rainfall climate. Science of The Total Environment, 550, 265-272. Dehais, M. (2011). Bioretention: Evaluating their effectiveness for improving water quality in New England urban environments. University of Massachusetts Amherst. Hathaway, J. M., Winston, R. J., Brown, R. A., Hunt, W. F., & McCarthy, D. T. (2016). Temperature dynamics of stormwater runoff in Australia and the USA. Science of The Total Environment, 559, 141-150. Lee, K.-H., Isenhart, T. M., & Schultz, R. C. (2003). Sediment and nutrient removal in an established multi-species riparian buffer. Journal of Soil and Water Conservation, 58(1), 1-8. Lim, K.-Y., Hamilton, A. J., & Jiang, S. C. (2015). Assessment of public health risk associated with viral contamination in harvested urban stormwater for domestic applications. Science of The Total Environment, 523, 95-108. Lye, D. (2009). Rooftop Runoff as a Source of Contamination: A Review | Rainwater Resources. Science of the Total Environment, 407, 5429-5434. Mahler, B. J., Van Metre, P. C., & Foreman, W. T. (2014). Concentrations of polycyclic aromatic hydrocarbons (PAHs) and azaarenes in runoff from coal-tar- and asphalt-sealcoated pavement. Environmental Pollution, 188, 81-87. Mattas-Curry, L. (2012). Around the water cooler: Riparian Buffers. Pennino, M., Mcdonald, R., & Jaffe, P. (2016). Watershed-scale impacts of stormwater green infrastructure on hydrology, nutrient fluxes, and combined sewer overflow in the mid-Atlantic region. Science of the Total Environment, 565, 1044-1053. Porse, E. C. (2013). Stormwater governance and future cities. Water, 5(1), 29-52. Society, T. F. (2013). Urban agriculture as a green infrastructure management strategy. Speak, A. (2013). 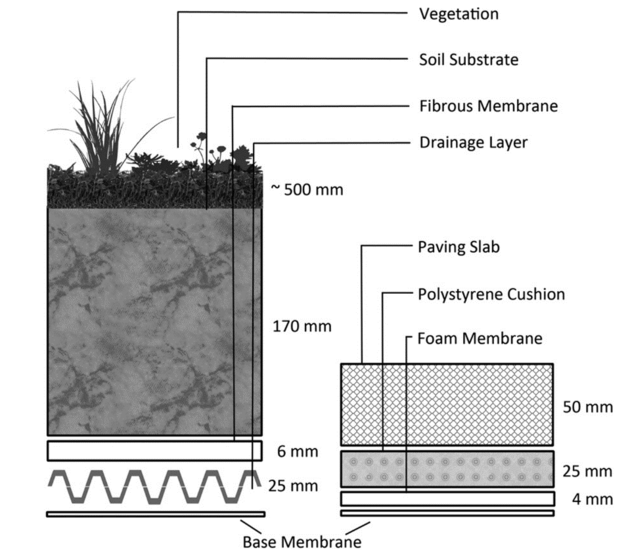 Rainwater runoff retention on an aged intensive green roof - Microsoft Academic. Science of the Total Environment, 461, 28-38. Taebi, A., & Droste, R. L. (2004). Pollution loads in urban runoff and sanitary wastewater. Science of The Total Environment, 327(1�"3), 175-184. Yang, B., & Li, S. (2013). Green Infrastructure Design for Stormwater Runoff and Water Quality: Empirical Evidence from Large Watershed-Scale Community Developments. [Article]. Water, 5(4), 2038-2057. Zanders, J. (2005). Road sediment: characterization and implications for the performance of vegetated strips for treating road run-off. Science of the Total Environment, 339(1), 41-47. MLA (Modern Language Association) "Green Infrastructure." ScienceAid, scienceaid.net/green_infrastructure Accessed 20 Apr 2019. Chicago / Turabian ScienceAid.net. "Green Infrastructure." Accessed Apr 20, 2019. https://scienceaid.net/green_infrastructure. Thanks to all authors for creating a page that has been read 103 times.